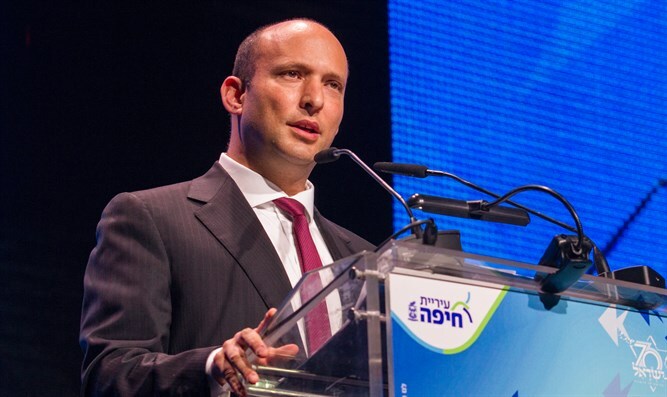 Education Minister Naftali Bennett on Thursday referred to the joint statement by the prime minister and Polish prime minister about the Polish role the Holocaust. The statement was published this morning as an ad in Israeli newspapers. Bennett noted, "The joint statement by the Prime Minister of Israel and the Prime Minister of Poland regarding the responsibility of Poles in the Holocaust is disgraceful, full of lies and distortions, and it desecrates the memory of many Jews murdered by Poles." "I respect and cherish the friendship between the two countries today, but as minister of education of the State of Israel, who is entrusted with imparting the memory of the Holocaust, I will not in any way lend a hand to distorting the events of the Holocaust. After consultation with the certified professionals, I establish unequivocally that this declaration has no historical and factual validity. There is a huge difference between a flawed Polish law and an official sanction of the government of Israel for distortions and lies," Bennett added. Bennett vehemently rejected the joint statement and announced that he was demanding that the decision be frozen until it was brought to the cabinet for approval: "It is better that there be no statement than a false statement signed by the government of Israel. This statement was not brought before the government, is not approved by government ministers, is unacceptable to me as minister of education, and I demand that the prime minister change it or cancel it immediately, or alternatively bring it to a vote in the government, where I am certain it will be rejected."